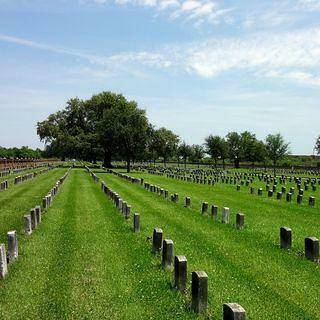 Established in 1864, Chalmette National Cemetery is a unit of the Jean Laffite National Historical Park and Preserve and is situated fifteen minutes outside of New Orleans. The cemetery is the final resting place for Union soldiers—including United States Colored Troops—who died in Louisiana during the Civil War. 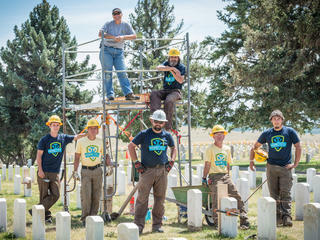 There are also more than 14,000 headstones that mark the gravesites of veterans of the Spanish-American War, World Wars I and II, and the Vietnam War. The national cemetery is located on the site of the 1815 Battle of New Orleans, next to Chalmette Battlefield, and is one of 14 national cemeteries managed by the National Park Service. During a month-long HOPE Crew project in March 2016, volunteers documented, realigned and cleaned headstones in the cemetery with the goal of connecting the city of New Orleans with the preservation movement and the National Park Service through hands-on work.